The ever-growing entertainment industry always encourages the development of new games and variations. The same is true in the gambling industry, which, in revenue and popularity, is also quite an opportunity. One interesting novelty that perhaps not every betting fan might have heard about is virtual horse racing. As the statistics from Esports Champions by Unibet show, the viewership of esports-related events continues to grow exponentially. In fact, in some locations and among specific age groups, it can be as popular a discipline as baseball or hockey. No wonder companies from almost every sector are doing everything they can to expand their businesses into the virtual world of electronic entertainment. Such is also the case with horse races. Virtual racing is a relatively new respond in that matter, having been on the rise a couple of years ago thanks to Asian markets. Virtual racing offers the opportunity to make a real money wager on the races, even after the coverage has ended, which is an option few bookmakers in the United Kingdom have, with dogs and horses being the main areas of interest. The idea behind this is that you bet on the outcome of computer-generated visuals of a specific sporting event. But in horse racing, the images are based on the animals’ movement, and the numbers are calculated from real match statistics. The odds come with the house edge and are established with the numbers assigned to a specific horse. The more numbers in the draw, the lower the odds, and vice versa. It should be noted that the same number cannot be drawn more than once. Therefore, there is only one outcome for one selection, which means the same horse won’t be classified at the same time as, for instance, the first and second. 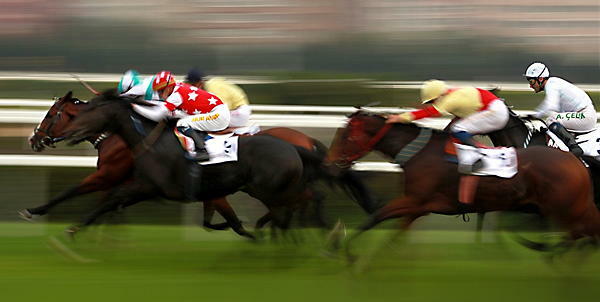 Currently, there are three types of wagers to be placed in virtual races. In the win/place category, you can bet on a single horse to win or not to win as well as to be placed either first, second or third and not to be placed at all. In the forecast category, you make a straight prediction about which horse will come first and second in a single bet. The alternation, dual forecast, allows you to bet on two horses for the first and second positions, regardless of the result. Similarly, the last option, tricast, is where you fill all three positions. Again, the straight variant is to predict the exact outcome, and the other (dual tricast) is for the three placed horses.